MW: Please introduce yourself to the Blastzone Online readers? JR: I am Jeremiah Raber a cast member off of Breaking Amish/Return to Amish on TLC also known as the Amish Rebel. MW: How did you get cast for Breaking Amish? JR: I knew the one producer for about 13 years. He asked if I’d want to do a show about the Amish and their lifestyle. Me being the person I am didn’t hesitate to give him a yes. I did a one hour interview and TLC approved it. MW: Take me on a ride into Jeremiah Raber’s life? JR: LOL. A ride into my life is very unpredictable. I live life one day at a time. Half the time I don’t know what’s going on till it happens. MW: Tell me about the first time you recorded for Breaking Amish? JR The first time recording I was a nervous wreck. I might be outspoken but the first few days of filming I wished I could run and hide. 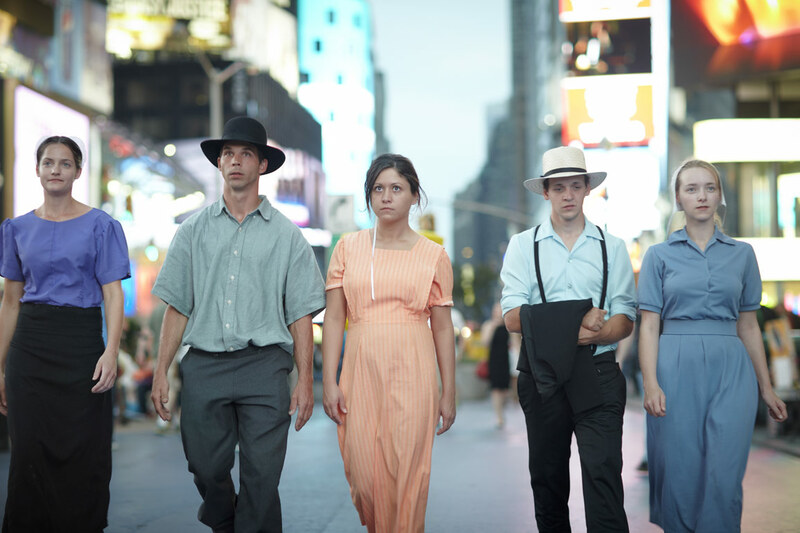 MW: What do you remember most about the first season of Breaking Amish? JR: Wow….there is so much that I could talk about lol. First of all, going from the country and horse and buggy to the city and cabs in itself is a major shock. Driving cab was probably the worst mistake i made while there. MW: What did you think of the whole Shunning Truth show? JR: The shunning truth gave me the chance to clear allot of rumors that were going around the internet. At the same time I felt like I was also being picked on more than the others. LOL I guess that’s what happens when you play the bad boy lol. MW: What do you remember most about Return to Amish? JR: Return to Amish has a lot of good memories. My favorite memory was the connection I felt with Mary who took me in as her own son. That was the closest I’ve ever been to feeling like I belong in a family. MW: What can we expect for the new season of Breaking Amish? JR: This season you will see a softer side of me that i never showed before. I actually bring my kids on this season. Being able to bring them onto the show with me was by far my favorite scenes I’ve done in four seasons. MW: What is the difference in a Amish and a Mennonite? JR: Amish are way more conservative then Mennonites. Mennonites have electricity where Amish don’t. Mennonites drive cars and Amish drive horse and buggy. The dress is also different. MW: What is the one misconception about being Amish/Mennonite? JR: The biggest misconception is that people think all Amish are the same and all Mennonites are the same. There so many different kinds. The second thing is people think all Amish get “Rumspringa”. Only about 40% get that. MW: What do you think of the other Amish shows? JR: I won’t say too much because I know almost every single person on them but I will say without a doubt I wouldn’t have been able to do what they did. I did watch them though and loved the shows. MW: How can fans reach out to you to say hi or request an autograph? JR: Fans can contact me or follow me on Facebook “Jeremiah Raber Breaking Amish” or on twitter @jraber11 or they can go to my website http://www.jeremiahraber.com which has plenty of info about the Amish and also my online store that has plenty of my own designs or you can upload your own photos and get them printed on shirts, hoodies, doggie hoodie, tote bags, and cellphone cases. MW: So let’s talk about people saying Breaking Amish is fake. What is your take on that? JR: Allot of people think they know how Amish live all because they might live around some or they heard certain things about the Amish. What those people don’t understand is that Amish live in 42 states and Canada. Every area has their own rules. Where I’m from there are 13 kinds of Amish. The strictest ones are just like the movie “witness”. The more modern ones have electricity, cell phones, computers, etc. so they have to realize not all Amish are the same. MW: For the record is Breaking Amish scripted? JR: I can’t sit here and say it’s 100% real because it isn’t. There is so much that goes into any reality show. Every place we go to has to be set up in advance meaning that the owner of every place has to sign a release prior to us filming at that location. Yes there are parts that are scripted. Every reality show is that way to make things juicy and interesting for the viewers. MW: Are you yourself not even Amish? JR: I was adopted into the Amish when i was 1 1/2. I was Amish till the age of 19 then i left. I’ve gone back 3 times now. At the end of season 3 it showed me going back into the Amish. If someone wants to know whether I’m Amish now then all I’ll say is watch our season 4 coming May 31st. Just remember, i am the Amish rebel. I do what i want. MW: Were you even Amish when you did the first season of Breaking Amish? JR: At the time of filming season one i had been out of the Amish faith for a while. Was it my first time in NYC? Yes it was so my reaction to the city was real’. MW: Explain what being shunned is? To you even care if you were shunned? JR: Being shunned means you aren’t living your life the way the Amish want you to. They say shunning is their way of showing love. They do it in hopes that you see what you’re doing wrong and you come back. When you are shunned then you can’t have contact with other Amish people. They pretty much cut you out of their life. I’ve gotten shunned every time I left but it never bothered me. They aren’t the judge. Amish or not I live my life the way i want to. Not the way someone else wants me to. MW: Would you say reality TV is not really reality? JR: They call it reality but with a little research you will find that they also call it “scripted drama”. MW: How do you really feel about the rest of the original 4 from season 1 of Breaking Amish? JR: Abe Schmucker – He means good with whatever he does. He has been there for me many times so I’m not going to say anything bad about him. Kate Stoltzfus – At first I didn’t like her but now I get along with her almost better than any of the others. Rebecca Byler – LOL she will always be Rebecca. Like me she is very out spoken but she’s very controlling. I have to say though; we’ve gotten along for the most part. Sabrina High At one point I had feelings for her but now I’m glad nothing came out of that. I can’t handle very emotional people. MW: How much of Breaking Amish is real and truthful? JR: I would have to say about 60% is real. I’ll let the viewer’s decide which part that is lol. MW: Last but not least what do you say to the haters who say you give Amish a bad name and that you are only trying to profit from the Amish name? JR: Haters can say whatever they want. If we make the Amish look bad then Jersey Shore made the Italians look bad. If they want to say that I’m just trying to profit off the Amish name then that means all these Amish markets you see in the cities throughout the U.S. are doing the same thing since they aren’t owned by the Amish. That would also mean allot of these Amish furniture stores are doing the same. A job is a job. MW: When is the new season of Breaking Amish coming on? JR: Return to Amish 2 which is our season 4 comes out Sunday may 31st. at 9 PM. JR: I would like to say thank you to all my fans and followers for supporting me through everything. Whether they know it or not they have helped me in so many ways. I wouldn’t be where I’m at today if it wasn’t for them. Again thanks for your support and hope you continue to watch our show! !